This is just the loveliest recipe! Perfect for breakfast or a healthy snack. 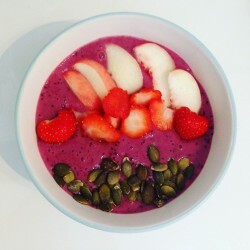 The Smoothie Bowl. So you’re going to need a blender, and the following ingredients, but once you have those things, this is actually very easy to make. For so long I didn’t actually have a food processor/blender and now I don’t know what I did without it! If you are on a consciously healthy eating journey, it’s a great investment. There are so many beautifully easy recipes that can be made using them, this being one of them…. Pop your ingredients (except from the pumpkin seeds) into the blender, and whizz up! Note : Freezing the banana gives this smoothie bowl a fab texture and cools the temperature. Simply break a banana into four and pop in a freezer bag and into the freezer. *Do pop your email address in the subscription box if you would like to be kept up to date with latest posts.